Yeah, yeah. Y’all know that my attention span can be–OOH! Sparklies! Let’s see, what was I talking about? Oh, yeah–SQUIRREL! Okay, seriously, this week I’ve felt like a squirrel on a triple espresso high. That’s okay. I’m going to get things under control if it kills me. I have editing to do! And stuffs like that there. Even so, this message from the Universe resonated. Science, faith, magic…as a writer, I deal with all these things. And that’s about as philosophical as I feel like getting today. Young souls lean on science, Silver. Mature souls lean on faith. And old souls, Silver, prefer long walks and short talks; whistling to hip-hop, country, or rock; and on occasion, tree spotting. There! On the horizon! Oak! Silver, please advise any young souls wishing to file a complaint over the light in which science was portrayed herein, to speak to a manager, beyond the trees. Why? Because Iffy is on the trail of a very perky squirrel who is hiding in a a very tall oak tree. What does that even mean?!? It means that Iffy and I are working on a short story (7K words max) to submit for the second RWA anthology, edited by Sylvia Day. Yeah. Really. So, are you a young soul or an old one today? This entry was posted in Writing Life and tagged inspiration, musing, Thursday Thoughts, Universe, writing. Bookmark the permalink. First off… that pic… ROFL! Heh, tree spotting sounds just about my speed today. But I have to knuckle down and work. I’ve been derailed for a week now, and well, bleh. E-nuff Z-nuff. After I’ve had coffee. Lots and lots of coffee. Here’s hoping you and Iffy get that squirrel bagged!!! Haha so funny! 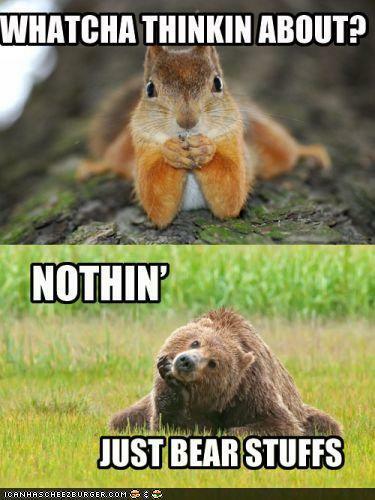 When I first saw squirrel I thought of my squirrels….you know, the hot ones. Good luck getting iffy corralled! I swear tomorrow I will get work done!